Home / What is your odour problem? What is your odor problem? What kind of animal odor? Where is the dog odor? Where is the smell of damp? On which surface is the odor of cat urine? What kind of food odor? Where is the skunk odor? Where is the farm smell? What does smell like perspiration? Where is located the odor? How to Neutralize Farm Odours on Clothing? Farm odours infiltrate fabrics and clothing. SOS Odours has developed odour neutralizing products that actually bind themselves to the malodorous molecule and thus eliminate it upon application. Clean your clothes by pouring 4 oz. (120 ml) of D-100 in the clothes washer. In this case, the product replaces the laundry detergent. It is also possible to spray SMOKERASER directly on the clothes if you wish to avoid cleaning. Leave to dry. If you get vomit or milk on a car seat, mattress or carpet, the odour may still persist even after cleaning the area many times. The vomit probably infiltrated inside the seat, mattress or carpet. An in-depth odour neutralizing treatment will be required, by injecting the URI-CLEAN product inside the mattress and car seat. To eliminate vomit or curdled milk odours, follow the steps described below. Carpets and fabric seats need to be cleaned with a carpet cleaning machine using 120 ml of D-500 in 4 liters of warm water. If you don’t have a carpet cleaner, spray the diluted product onto the carpets and seats, then dry. Spray URI-CLEAN from 10 cm way onto the affected area. Properly ventilate and leave to dry. If the vomit or the curdled milk has penetrated deep into the seat or mattress, inject URI-CLEAN with a syringe and needle. If vomit or curdled milk has got onto your wood floor and the smell persists, URI-CLEAN will effectively neutralize this unwanted odour. If the vomit or the curdled milk got between the floor boards, inject URI-CLEAN into the joints with a squeeze bottle. Wipe the area with a clean cloth. Repeat these steps as required. If vomit or curdled milk has got onto your ceramic floor and the smell persists, URI-CLEAN will effectively neutralize this unwanted odour. Apply URI-CLEAN with a squeeze bottle to ensure it properly penetrates the ceramic grout. If an odour persists, smell the surrounding area to find other spots where vomit may be. Repeat the treatment as required. How to Neutralize Oil Spill Odours on Concrete? You have had an oil spill and the odor persists in your house? Relying on over 30 years of expertise, SOS Odours offers a unique solution and approach against very strong and harmful odors. Spray the surface affected by the oil (concrete). Leave product to dry naturally. Repeat the application if odor persists after a few days. Note that if the oil spill reached a carpet or fabric, the items will need to be removed or discarded as they are not treatable. You carried a can of diesel or gasoline in the trunk of your car and it overturned? Relying on over 30 years of expertise, SOS Odours offers a unique solution and approach against very strong and harmful odours. How to Neutralize Diesel Odours in a Vehicle? Mix one part of DUAL-100 with one part of water. Remove the DUAL-100 with a carpet cleaning machine. How to Neutralize Fuel/Gas Odours in a Vehicle? Dilute 300 ml of D-125 in 4 liters of water. Spray the trunk upholstery generously. Leave on and allow product to work for 20 minutes. Remove the D-125 with a carpet cleaning machine. If the odor persists in the car, spray SMOKERASER onto the metal and upholstery affected by the fuel. For fabric seats, you can spray SMOKERASER directly onto them. Allow to dry and properly ventilate. For leather, spray SMOKERASER onto a clean cloth and wipe the seats with the cloth. Always start by testing a non-visible area. Wipe off excess product from the leather, if any. Repeat the SMOKERASER treatment as needed. How to Neutralize Perspiration Odours in Clothing? Clothing can trap very unpleasant perspiration odours. With an expertise spanning over 30 years, SOS Odours offers a unique solution and approach against perspiration odours. Manufactured in Quebec, SPORTS ODOUR contains an odour neutralizer technology that really works. It’s effective, simple to use and acts upon application. Spray SPORTS ODOUR onto the clothing after each activity. Whether damp or dry, SPORTS ODOUR will be 100% effective. Place the clothing or fabric into the washing machine and wash using regular detergent. Repeat after each training session. 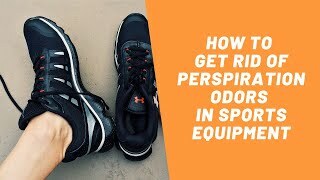 How to Neutralize Perspiration Odours in Shoes? Shoes can emit very unpleasant perspiration odours. With an expertise spanning over 30 years, SOS Odours offers a unique solution and approach against malodours. Manufactured in Quebec, SPORTS ODOUR contains an odour neutralizer technology that really works. It’s effective, simple to use and acts upon application. Learn how SPORTS ODOUR can eliminate these persistent odours in minutes. Spray SPORTS ODOUR inside the shoes after each activity. Whether damp or dry, SPORTS ODOUR will be 100% effective. How to Neutralize Damp Odours on a Carpet? You had water damage in your home and your carpet smell damp? Your car mats release a damp smell? On very hot days, this odour could be even worse. Here’s how to get rid of the unwanted odour. Dilute 120 ml of OSMIX-42 in 4 liters of water. Test on a non-visible area to ensure there is no discolouration. Put the diluted OSMIX-42 into a carpet cleaner machine and proceed to wash the carpet or sofa. Dry by running a fan. How to Neutralize Damp Odours on Clothing or Fabric? A bag of wet clothes was forgotten? You are returning from a tropical country, and your clothes have a damp smell? This odour penetrates the fibers of the fabrics and can remain for a long time. With an expertise spanning over 30 years, SOS Odours offers a unique solution and approach against damp odours. Manufactured in Quebec, our products contain an odour neutralizer technology that really works. It’s effective, simple to use and acts upon application. Spray SMOKERASER onto the clothing or fabric. Place the clothing or fabric into the washing machine and wash using regular detergent. For fabrics that need to be dry cleaned, spray them with SMOKERASER and allow to air dry naturally. How to Neutralize Damp Odours on Concrete or Wood? You have damp odours in your cottage or basement? Damp odours in basements can have many causes, such as loamy soil, water veins, stagnant water under the floor, drains in inappropriate areas, uneven terrain, etc. It’s important to find the source of this unwanted odour and fix it. Dilute 120 ml of OSMIX-42 in 4 liters of warm water. Spray OSMIX-42 onto the concrete and leave on. Spray OSMIX-42 onto the wood (2 x 4s) and leave on. To treat the surrounding air, spray the diluted OSMIX-42 onto a clean cloth and hang in front of a fan. Run the fan for an hour in each room affected by the damp odour. You can also spray the diluted OSMIX-42 onto the filters of an air exchange unit or ventilation system. How to Neutralize Smoke Odours in the House? If you have had cigarette smoke in your house, it’s important to know that smoke impregnates everything. It gets into fabrics, ventilation systems, plastics, wood, metal, and furniture. We recommend cleaning the entire house as a first step to eliminate the nicotine particles found all over the walls, ceilings, floors, cabinets, etc. Dilute 30-60 ml of D-125 in a bucket of warm water. Wash the walls, ceilings, floors, cupboards, wooden furniture and electronic appliances with this cleaning solution. This will dislodge the nicotine particles. D-125 is an all-purpose cleaner that contains an odour neutralizer for cigarette, cigar and fire smoke. Spray SMOKERASER onto any affected areas, such as the sofa, carpet, pillows, mattresses or curtains. Do not dilute. Leave it on fabrics. If a smoke odour persists in ambient air, spray SMOKERASER onto a clean cloth and hang the cloth in front of a fan. Run the fan for 1 hour in each room that smells of cigarette smoke. Repeat the SMOKERASER treatment as needed in the following days. How to Neutralize Smoke Odours in a Vehicle? Cigarette smoke can impregnate the carpets, car seats, the ventilation system, the roof, plastic, seat belts, etc. This is why you need to spray SMOKERASER onto all surfaces. Manufactured in Quebec, SMOKERASER contains an odour neutralizing technology that really works. It is effective, simple to use and acts upon application. Spray SMOKERASER onto any affected areas, such as car seats, upholstery and seat belts. Do not dilute. Leave on the fabrics and upholstery. Then spray D-125 diluted into the air vents of the vehicle. Run the heating system for several minutes to allow the product to properly penetrate into the ventilation system materials such as the plastic. How to Neutralize Smoke Odours on Clothing or Fabrics? With cigarette smoke, it’s important to know that smoke impregnates everything it touches. You may be left with unpleasant odours in fabrics, ventilation system, plastics, wood, metal and furniture. To eliminate these odours, use SMOKERASER. This is a concentrated product that quickly eliminates old smoke smells that have built up over time. Spray SMOKERASER onto any affected areas, such as the sofa, carpet, pillows, mattresses or curtains. Do not dilute. 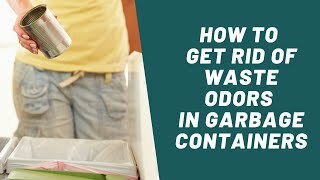 How to Neutralize Garbage Odors in Indoor Containers? If the garbage or compost bin in your house is giving off unpleasant odors, SOS Odours has developed a unique product called BAC-500 for this exact problem. BAC-500 is an odor neutralizer specially designed for waste odors from various containers. It is an effective cleaner for residential garbage bins, and it eliminates impregnated odors at the same time. Spray BAC-500 into the garbage container or compost bin, then wash as usual. Rinse with clean water and wipe dry. Before replacing the bag, spray BAC-500 again and leave in the container. By leaving the product to work before rinsing, you are allowing the odor neutralizing technology to properly penetrate the pores in the plastic. Put in new garbage bag. Repeat the treatment inside the container as necessary. How to Neutralize Burned Proteins Odours? A roast or chicken was forgotten in your oven? The smell of burned proteins will infiltrate throughout the kitchen (ventilation ducts, fabrics, range hood and ambient air). Here is what you need to do to remove those bad odours. Dilute 360 ml of DUAL-100 in 4 liters of water. Wash the walls, ceilings and countertops with this cleaning solution. Remove the filters from the stove hood and let it soak in the cleaning solution for 1 hour. For clothing, take the garments to a dry cleaner. Children’s toys should be washed in DUAL-100 (120 ml of DUAL-100 in 4 liters of water), then disinfected with Germosolve 5. For plastic objects (shopping bags, zip lock bags, shower curtains, etc. ), they will need to be replaced as they cannot be treated. If an odour persists in ambient air, spray SMOKERASER onto a clean cloth, then hang the cloth in front of a fan. Run the fan for 1 hour. Move the fan to any room affected. Do your work clothes smell like grease (from restaurants/garages), even after washing them? Here is how to get rid of those unwanted smells. How to Neutralize Grease Odours from Clothing or Other Fabrics? Dilute 120 ml of DUAL-100 (degreaser and neutralizer) in 4 liters of water. Wash in a conventional washing machine using regular detergent. How to Neutralize Grease Odours from Floors? Wash the floors and countertops with this cleaning solution. How to Neutralize Cooking Odours? Cooking certain foods such as fish, seafood and spices can sometimes leave odours that are hard to remove. The smell of cooked food spreads in the air, but also in the range hood, the fabrics, and in the ventilation ducts. With an expertise spanning over 30 years, SOS Odours offers a unique solution and approach against malodours. Manufactured in Quebec, our products contain an odour neutralizer technology that really works. It’s effective, simple to use and acts upon application. Clean the ceramic around the stove with this cleaning solution. With the solution, wash the floors, walls and countertops. If your vehicle was sprayed by a skunk and the odour has spread to the interior of the vehicle, two treatments are required: one for the exterior under the vehicle and another for the interior. How to Neutralize Skunk Odours Outside the Car? Simply spray MH-45 under the vehicle (including the engine), ensuring it is diluted to 1 part MH-45 to 5 parts warm water. Do not treat the interior of the vehicle with MH-45. Leave on under the vehicle. How to Neutralize Skunk Odours Inside the Car? If the interior of the vehicle is in fabric, spray URI-CLEAN onto the seats and carpets. Repeat as required. If the interior of the vehicle is leather, spray URI-CLEAN onto a dry cloth, then wipe the seats and leave on for several minutes. Then wipe with a dry cloth to remove any excess URI-CLEAN. Always test on a section of the leather that is less visible. Note that imitation leathers contain dyes that may discolour after applying URI-CLEAN. Skunks have the unfortunate ability to sneak under balconies and outdoor sheds, despite the fact that the holes can be very small. 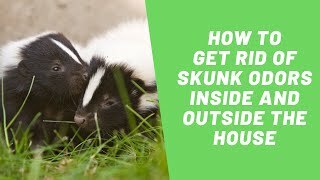 If a skunk has sprayed under your balcony, and the smell is impregnated into the brick wall or the concrete foundations of the house, it is possible to neutralize the smell. How to Neutralize Skunk Odour on Brick Walls or Cement? Simply spray MH-45 onto the affected area, ensuring it is diluted to 1 part MH-45 to 5 parts warm water. If the odour persists, repeat the treatment a few days later. Simply spray D-500 onto the affected area, ensuring it is diluted to 240 ml per 4 liters of warm water. Usually only one application is required. However, repeat as required if the odour is particularly strong. 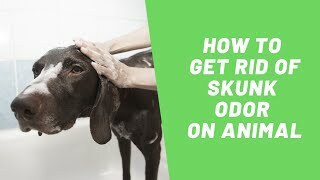 How to Neutralize Skunk Odours on a Dog Or a Cat? Your cat or dog has been sprayed by a skunk? You have tried the home remedies without conclusive results? With the slightest rain of humidity the odour reappears on your animal? SOS Odours has developed an effective solution! As soon as your cat or dog gets sprayed by a skunk, follow these steps for quick and effective results. Satisfaction Guaranteed. If you see yellow liquid on your pet, remove it as quickly as possible with a hose and/or cloth. Leave your pet outdoors and spray MAGIC ODOUR all over your dog. If your pet has a long coat, ensure MAGIC ODOUR reaches all the way to the base of the hairs. Treating the head area is essential as it is usually the area sprayed first. Spray MAGIC ODOUR onto a clean cloth and apply on the head area. Be careful around the eyes, nose and mouth. If you avoid treating the animal’s head with MAGIC ODOUR and MAGIC SHAMPOO, you may not get the results you desire. Allow the product to work for 5 minutes. This first step will decrease the skunk odour instantly so you can proceed safely to the second stage. Bring the dog indoors for shampooing. Wet the animal completely with lukewarm water and then wash with MAGIC SHAMPOO, lathering the entire body and rubbing in well. Treating the head area is essential as it is usually the area sprayed first. Put MAGIC SHAMPOO and water onto a clean cloth and apply on the head area. Be careful around the eyes, nose and mouth. If you avoid treating the animal’s head with MAGIC ODOUR and MAGIC SHAMPOO, you may not get the results you desire. Allow the product to work for 20 minutes. If you found yellow skunk spray on the fur, leave MAGIC SHAMPOO on for an extra 10 minutes for optimal results. Rinse with cold water and then dry your pet with a towel or blow dryer. How to Neutralize Cat Urine Odour in Litterboxes? Does your cat litterbox smell? It’s important to understand that plastic absorbs odours. You therefore need to wash it with ELIMIN-O-DEURS and allow the product to penetrate into the plastic and neutralize the litterbox odour. Two in one, this product can easily replace a conventional detergent that does not contain any litter-specific odour neutralizers (urine, feces). Remove all content from the litterbox. Spray ELIMIN-O-DEURS into the litterbox and leave it to work for 10 minutes. How to Neutralize Cat Urine Odour on Clothing or Bedding? Are you faced with a smell of cat urine on your clothes, bedding or on a bed cover? SOS Odours has developed an effective solution to eliminate cat pee smell on clothing and bedding. URI-CLEAN is an effective product that contains odour-neutralizing technology. Simple to use and safe for your environment, URI-CLEAN does not mask the odours, it eliminates them at the source as this product is an odour neutralizer, and not just a deodorant. To get rid of the cat urine smell on your clothing or bedding, simply follow the steps described below. Spray URI-CLEAN onto the fabric where the urine is found, then machine wash on regular cycle using laundry soap. If the fabric is not washable, spray it with URI-CLEAN, then dry in a tumble dryer for 30 minutes or leave to air dry. How to Neutralize Cat Urine Odour on a Carpet? Your cat had a little accident on your carpet, and a strong smell of cat pee remains? SOS Odours’ corporate mission is to create efficient, easy to use and safe products for your environment, in order to provide you with appropriate solutions to your odour problems. URI-CLEAN contains an odour-neutralizing technology that will completely eliminate this unpleasant odour, even if it has been present for a long time. After cleaning the cat urine left on the carpet’s surface, the smell is not completely neutralized as this is only the first of two steps. If your carpet is shaggy, it is important to inject the product using a syringe and needle, as urine obeys the laws of gravity and may have reached the deepest layer of the carpet. Not being a deodorant, but an odour neutralizer, URI-CLEAN eliminates odours at the source and does not mask them. To get rid of that cat urine smell on the carpet, simply follow the steps below, or watch the video. First, make a circle around the affected area (using string or similar), making sure the circle is 10-12 cm (4-5 inches) larger than the affected area because the urine may extend beyond the visible area. Inject URI-CLEAN with a syringe and needle while applying downward pressure from the exterior of the circle and working inwards, leaving a space of 2.5 cm between each injection all the way to the centre. Spray URI-CLEAN onto the affected area (from 10 cm away). If the carpet is thin with short fibres (e.g. a doormat), simply spray URI-CLEAN over the area where the dog urinated. Leave on. Repeat as required. Examine the underside of your short-pile carpet. If a ring of urine is present, spray Uri-Clean directly on the stain and let it dry. How to Neutralize Cat Urine on a Hardwood Floor? Does your hardwood, floating or parquet floor emit a strong cat urine odour? We have developed an effective, easy-to-use and safe product for your environment, so that you can eliminate the cat urine smell on your hardwood or floating floor. Varnished wood floors are not porous materials that can absorb urine. Liquids will actually penetrate between the boards of the floor, where cracks, holes and joints are found. Therefore, the urine will seep between the planks of the floor. Consequently, it is important to apply the URI-CLEAN product on the area where the urine is found, thus directly on the source of the bad odour. Because this product is alcohol-based, URI-CLEAN is ideal for removing cat pee smell on a hardwood or floating floor as it will not make the wood swell, unlike products composed almost entirely of water, such as enzyme or bacteria based products. Additionally, URI-CLEAN will not create an environment conducive to mold growth. It completely eliminates the odours and does not mask them, contrary to floor deodorants or fresheners. Pour URI-CLEAN into a squeeze bottle. Squeeze URI-CLEAN between each floorboard to ensure it penetrates well. If the urine is close to a wall, apply URI-CLEAN into the space between the baseboard and wall with a squeeze bottle. It’s possible that the URI-CLEAN did not reach the urine with the first treatment. In this case a second treatment is necessary. Wipe the treated surface to remove any excess product. If you still smell the odor, locate where the odor is strongest and apply URI-CLEAN to that area again. It’s possible that the product didn’t reach the urine completely with the first treatment. Your cat urinated on your sofa? Many customers ask us how to get rid of the cat urine smell on their couch or sofa. First, it is important to know that even a thorough cleaning of the affected area will not neutralize the urine odour at its source, as this is only the first of two steps. By applying the URI-CLEAN product on your sofa, you will effectively and completely eliminate the cat pee smell. As it is alcohol-based, URI-CLEAN does not create an environment conducive to the development of mold, and it dries quickly, unlike enzymatic or organic products. How to neutralize the smell of urine on a fabric-covered sofa? If the sofa covering is made of fabric, URI-CLEAN must be injected using a syringe and needle in order to reach the source of the urine odour, deep into the sofa. You need to treat the affected area starting from the exterior of the circle and working inwards, leaving a space of 2.5 cm (1 inch) between each injection all the way to the centre. The idea is to completely encircle the urine. Inject 5-10 cc of URI-CLEAN from the syringe with each injection. Ensure you have a needle on the end of the syringe. Finally, spray URI-CLEAN onto the affected area (from 10 cm away). How to neutralize the smell of urine on a leather couch? If the couch is covered with leather, it is important to conduct a compatibility test on a non-visible surface before using the product. Here are the steps to follow to eliminate the cat urine smell impregnated into your leather couch. You can also watch the video. We always recommend testing on an area of the leather that is less visible first (e.g. the back of the furniture). Note that imitation leather may become discoloured. Spray URI-CLEAN onto a clean cloth and gently wipe the affected area. Leave to dry. To remove any excess URI-CLEAN remaining after the treatment, wipe the area with a clean, dry cloth. Note that we recommend repeating the procedure rather than using a large quantity the first time. 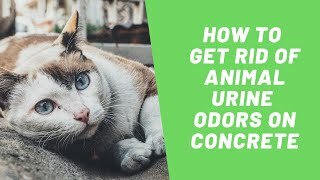 How to Neutralize Cat Urine Odour on Concrete? Your cat accidentally peed on the concrete floor in your home and a strong smell of urine emanates from it? Because cement is a porous material, the urine has been absorbed by the concrete floor. SOS Odours has created a simple, effective and safe solution for your environment to neutralize cat pee smell on concrete. URI-CLEAN is an animal urine odour neutralizer that completely eliminates odours, it does not mask them as do deodorant or freshening products. 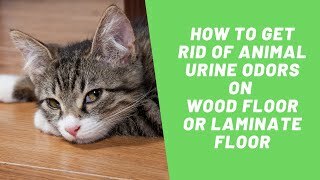 To get rid of the cat urine smell on the concrete floor of your house, we recommend that you follow the steps below, or simply watch the video. First, vacuum the cement then wash using D-500. Dilute 120-180 ml of D-500 in 4 liters of warm water. This will eliminate the urine odour from the surface of the concrete. The floor can be left to dry naturally in the summer or by using heat in the winter. Spray URI-CLEAN onto the area(s) of the concrete where urine is found and leave on. Repeat as required. Aerate the room after. 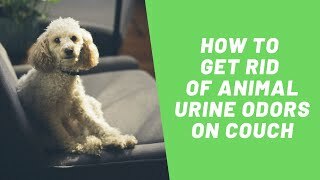 If your pet has urinated several times in the same place, you will need to apply URI-CLEAN more than once so that it can penetrate deeper into the concrete and reach the urine. Urine is obviously subject to the effects of gravity. How to Neutralize Cat Urine Odour on Ceramic? Did your cat urinate on a ceramic, slate, porcelain or tile floor? Tile joints and ceramic grout are porous substances that absorb liquids, such as urine. Therefore, it is important to treat the source of the odour by applying URI-CLEAN directly on the tile or ceramic joints, to completely remove cat pee smell. Additionally to being easy to use and effective, URI-CLEAN is safe for your environment. URI-CLEAN is a true neutralizer that eliminates the odours entirely as soon as it reaches the source, it does not mask them. To get rid of the cat urine smell on your ceramic or tile floor, simply follow the steps below, or watch the video. Apply URI-CLEAN with a squeeze bottle to ensure it properly penetrates the ceramic grout. Gravity plays a major role in odour problems. If an animal has urinated repeatedly in the same area, you will probably have to do more than one treatment of URI-CLEAN. If an odour persists, smell the surrounding area to find other urine spots in the room. Repeat the treatment as required. A strong smell of dog urine emanates from your sofa, and you are looking for the best solution to remove this bad odour? It is important to know that despite a thorough cleaning of your couch, the smell of urine will always remain. That’s why it is crucial to neutralize the urine odour at the source, by applying the URI-CLEAN product. Being alcohol-based and not water-based, URI-CLEAN dries quickly and will not cause mold in your sofa, unlike enzymatic or organic products. If the sofa covering is made of fabric, URI-CLEAN must be injected using a syringe and needle and by applying pressure during the injection, in order to reach the mass of the urine. To get rid of the dog urine smell on furniture such as a fabric-covered sofa, just follow the steps below, or watch the video. If the couch covering is made of leather, you must first make sure that it is actual leather and not an imitation. It is also important to conduct a compatibility test on a non-visible surface before using the product. Here are the steps to get rid of the smell of dog urine impregnated in your leather couch. You can also watch the video. How to Neutralize Dog Odours in Vehicles? Do you have a dog and it leaves an odour in your vehicle? The dog smell enters into the vehicle’s ventilation system and is absorbed by all the fabrics (seats, carpet). Find out how to eliminate this odour with SAM. This product contains a unique smell neutralizer that releases a fresh lemon scent. Spray SAM (from 10 cm away) onto the car seats and carpets. Leave to dry. Aerate the vehicle. Spray SAM into the air vents and run the heat on high for a few minutes. This will allow the product to work within the ventilation system and in the surrounding air of the vehicle. How to Neutralize Dog Urine Odours on Clothing or Bedding? Your dog urinated on your clothes, bedding or bedspread? SOS Odours’ corporate mission includes providing you with an effective product to remove the smell of dog pee on clothing and bedding. URI-CLEAN contains effective odour-neutralizing technology that is easy to use and safe for your environment. Furthermore, URI-CLEAN does not mask the odours, it eliminates them at the source since it is not a deodorant product, but an odour neutralizer. To get rid of a dog urine smell found on clothing or bedding, simply follow the steps described below. 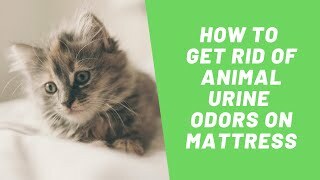 How to Neutralize Dog Urine Odours on Mattresses? Your dog made a mess on your mattress, which now reeks of dog pee? SOS Odours has developed an effective, easy to use and safe product to eliminate the smell of dog urine on the bed, even if this odour has been present for several weeks, or even months. The URI-CLEAN product is alcohol-based, unlike enzymatic products that are composed almost entirely of water. Since alcohol evaporates, URI-CLEAN does not cause mold in the mattress as it dries very quickly. URI-CLEAN is not a mattress deodorizer or freshener, but rather an odour neutralizer that removes odours at the source. To get rid of the dog urine smell on your mattress, just follow the steps below, or watch the video. Lightly spray URI-CLEAN onto the affected area of the mattress and leave to dry. If you are treating multiple areas of the mattress with URI-CLEAN, ensure the room is properly ventilated because URI-CLEAN is an odor neutralizer, not a deodorizer. The product’s scent may remain in the room for a few days. 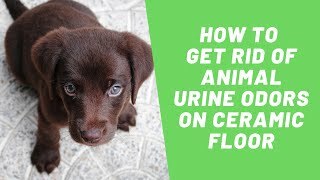 How to Neutralize Dog Urine Odours on Ceramic Flooring? Are you faced with a smell of dog urine on a ceramic, slate, porcelain or tile surface in your home? It is important to understand that ceramic tiles do not absorb urine. However, tile joints or ceramic grout are porous substances that do absorb liquids, such as animal and human urine. It is therefore necessary to treat tile or ceramic joints directly to remove dog pee smell. URI-CLEAN is an effective urine odour neutralizer that is easy to use and safe for your environment. URI-CLEAN is not a deodorizer as it actually eliminates the odours at the source, and does not just mask them. To get rid of the dog urine smell on your ceramic tiles, simply follow the steps below, or watch the video. How to Neutralize Dog Urine Odors on Carpets? Your dog urinated on a carpet? Whether the carpet is short-pile or shaggy, SOS Odours has developed a product that contains odour-neutralizing technology which completely eliminates the smell of dog pee on a carpet. URI-CLEAN is an effective, easy to use and safe product for your environment that removes the smell of urine, even if it has been impregnated for weeks, or even months. After cleaning the dog urine left on the carpet’s surface, the smell is not completely neutralized, as this is only the first of two steps. If you have a shag carpet, it is important to apply the product using a syringe and needle, as urine obeys the laws of gravity and may have reached the deepest layer of the carpet (jute). By injecting URI-CLEAN inside your carpet, you will eliminate the smell of dog urine at the source since the product does not just mask the odours as do carpet deodorants or fresheners. To get rid of the dog urine smell on your carpet, follow the steps below, or just watch the video. If the carpet is thin with short fibres (e.g. a doormat), simply spray URI-CLEAN over the area where the dog urinated. Inspect the underside of the carpet. If you notice urine, spray URI-CLEAN directly onto the area and let dry. How to Neutralize Dog Urine Odors on Wood Flooring? Did your dog urinate on the hardwood, floating, or parquet floor in your house? SOS Odours has developed an innovative solution to completely eliminate the smell of dog pee present for months, or even years. Varnished wooden planks do not absorb urine, since the varnish prevents any liquid from penetrating. However, animal urine will seep between the planks of the floor, where holes, cracks and joints exist. It is important to apply the URI-CLEAN product directly on the source of the bad odour, where the urine is found. URI-CLEAN was specifically developed to avoid damage to floor coverings. As this product is alcohol-based, it will not make the wood swell or damage the floors, as may other products composed mainly of water. Additionally, URI-CLEAN will not create an environment conducive to mold growth. Contrary to floor deodorants and fresheners, it does not mask the odours, but eliminates them completely. To get rid of dog urine smell in a wood floor, just follow the steps below, or watch the video. Squeeze URI-CLEAN between each floorboard to ensure it penetrates well. If the urine is close to a wall, apply URI-CLEAN into the space between the baseboard and wall with a squeeze bottle. If you dog has urinated on the lawn, deck or shrubs, find out how D-500 will help you completely eliminate odours from your backyard. First, identify the type of surface where the dog urine is found, then follow the steps to neutralize this odour. Simply spray D-500 onto the wood, ensuring it is diluted to 45 ml per 1 liter of warm water. Leave on, no need to rinse. Usually only one application is required. However, repeat as required. Simply spray D-500 onto the concrete, ensuring it is diluted to 45 ml per 1 liter of warm water. Leave on, no need to rinse. If the urine odour persist, spray URI-CLEAN onto the area(s) of the concrete where urine is found and leave on. Repeat as required. Simply spray D-500 onto the affected area(s), ensuring it is diluted to 120 ml per 4 liters of warm water. Leave on, no need to rinse. Usually only one application is required. However, repeat as required. Note that the product will not harm the grass. How to Neutralize Dog Urine Odours on Concrete? Are you struggling with a dog pee smell on the concrete floor of your garage? It is important to treat the source of the urine odour directly, as cement is a porous material that absorbs liquids such as animal urine. SOS Odours has developed a simple, effective and safe solution for your environment. URI-CLEAN is an animal urine odour neutralizer that removes odours at the source, it does not mask them as do deodorant products. To get rid of the dog urine smell on your garage floor, simply follow the steps below or watch the video. Spray URI-CLEAN onto the area(s) of the concrete where urine is found and leave on. Repeat as required. 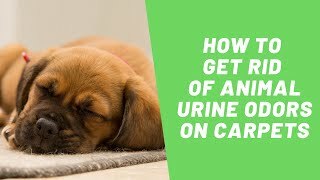 If your pet has urinated several times in the same place, you will need to apply URI-CLEAN more than once so that it can penetrate deeper into the concrete and reach the urine. Urine is obviously subject to the effects of gravity. How to Neutralize Urine Odours in Kennels? Are you are a dog kennel owner and finding it difficult to eliminate urine odours that have permeated floors or outside in the dog runs? Our clients include several kennels, and they are unanimous about the effectiveness of the SOS Odours products. As soon as the odour neutralizer touches the urine impregnated surface, the product starts to work. First, wash cement or rubber flooring with D-500. Allow the surface to dry naturally. For concrete, also spray URI-CLEAN onto the areas with urine stains and leave on. Repeat as necessary. For cages, D-500 should be used diluted to 90 ml per 3.8 liters of warm water. Simply spray into the cage and allow product to work for 10 minutes, then rinse with clean water. For crushed gravel (outdoor enclosures), D-500 should be used diluted to 120-180 ml of product per 4 liters of warm water. Simply spray D-500 over the crushed gravel. Allow product to work naturally as it will follow the same path as the urine, neutralizing the urine at the source. Rinsing is not required. You should notice instant results. If the urine has seeped into the joints of a ceramic floor, apply URI-CLEAN with a squeeze bottle to ensure the neutralizer penetrates between the ceramic tiles. If an odour persists, smell the surrounding area to find other urine spots in the room. Repeat the treatment as required. If the urine has seeped between the boards of the hardwood or floating floor, squeeze URI-CLEAN into each crack between the floorboards with a squeeze bottle to ensure the neutralizer penetrates between the floor boards. Wipe the floor surface after treatment to remove any remaining product. Properly ventilate the room. If an odour persists, smell the surrounding area to find other urine spots in the room. Repeat the treatment as required. If you want to neutralize pet odours in your kennels, wash the floors with D-500. Odors in the surrounding air will be removed at the same time. Dilute 120 ml of D-500 in 4 liters of warm water. Your kennels will smell fresh and clean all day long! You usually clean your rodent’s or reptile’s cage with a conventional detergent, but you can never eliminate the impregnated odours of urine and feces? We have developed a 2-in-1 product that allows rodent and reptile owners to effectively clean the cages, while neutralizing the lingering odours of urine and feces through a quick and simple solution. Discover ELIMIN-O-DOURS for cage and experience the brand-new cage feeling. How to Neutralize Urine Odour in a Cage? Remove all waste from the cage. Spray ELIMIN-O-DOURS into the cage and leave for 5 minutes. It’s important to treat both the plastic and metal because these materials absorb odours. How To Neutralize Urine Odour On Cement? Follow the steps or watch the video. Spray URI-CLEAN onto the area with urine. Leave on. Repeat as required. How to Neutralize Farm Odours in Vehicles? If you work on a farm, then you probably know that farm odours can impregnate anything in vehicle, such as upholstery, car seats, the ventilation system, the roof, plastic, seat belts, etc. Manufactured in Quebec, SMOKERASER contains an odour neutralizer technology that really works. It’s effective, simple to use and acts upon application. A single product is required.